entertainment industry executives, directors and securities analysts. to work at the Disney Studios at 2719 Hyperion Avenue in Hollywood, California. (Les had met Walt while serving him ice cream at a Hollywood confectionary on Vermont Avenue.) Walt warns him "it might be just a temporary job." Les Clark will go on to become the first of Walt's "Nine Old Men" and stay with the Disney Studio for nearly half a century until his retirement in 1975! 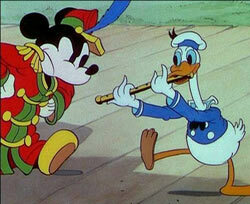 (the first Mickey cartoon to be shown at the Music Hall). made.) In The Band Concert, Mickey leads his ensemble through a rendition of "The William Tell Overture"
squeak in his car ... or else! Disney's second animated feature Pinocchio (which premiered in early February) is generally released in the U.S. Unlike Snow White, it will not initially be a financial success and its release in Europe and Asia will be delayed because of World War II. "Davy Crockett At the Alamo" airs on ABC-TV's Disneyland series. Walt Disney's Wonderful World of Color airs the 3rd and final episode of "The Scarecrow of Romney Marsh." or for Television is awarded to A Bug's Life, composed by Randy Newman. Trade" for the first time. The Disney Gallery (located in New Orleans Square in Disneyland) opens its doors to reveal a special art exhibit featuring 100 images of Mickey Mouse created by former Disney Imagineer Eric Robison. The exhibit will remain on display through September 8th. At Walt Disney World, one of the park's longest running shows, Legend of the Lion King, has its final curtain call after more than 75,000 performances. The premiere screening of Disney's Cinderella II: Dreams Come True is held at the El Capitan Theater in Hollywood. (It will premiere exclusively on DVD and video on February 26.) Voice-over actresses Jennifer Hale and Russi Taylor and recording artist Brooke Allison are all on hand for the event. Best Song Written for a Motion Picture, Television, or Other Visual Media. Also Monsters, Inc. - Scream Factory Favorites (by Riders in the Sky) wins for Best Musical Album for Children. to open late in 2008 at Disney World and Disneyland Resort. The Disneyland episode "Davy Crockett" wins a Golden Globe Award for Best TV Show. "When he was inside the whale and he sneezed Geppetto out, Walt came up with the line, "Gesundheit." One of the biggest laughs from the picture; it's that spontaneous stuff that makes all the difference." Uma Thurman, is released by Touchstone Pictures. Winners will be announced April 6. The line for the Michael Jackson film, Captain EO, swells to about 70 people as the sun comes up on the movie’s first day back at Disneyland. About 35 fans had already been in line by 6 a.m. on this day, about 4 hours before the first showing of the return of the 3-D movie at the Tomorrowland theater (where it originally played from 1986 to 1997). Although the park opens at 9:30 a.m., Disney officials allow Jackson fans to line up early on the west side of Disneyland’s main entrance. "Mice" in the production number "Sing and Dance." engineering, from February 21 to 25). 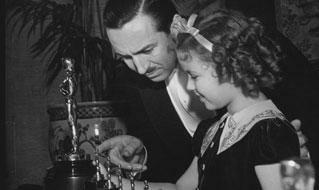 statuettes presented on this day in 1939, are today displayed at The Disney Family Museum in San Francisco, California. within Disney's ESPN Wide World of Sports Complex in Lake Buena Vista, Florida. The start of a 17-game home schedule, the Braves lose on this day to the New York Yankees, 8-3.
songwriting team also wrote seven songs for Disney's 2011 animated release "Winnie the Pooh." Phil Smith, Walt Disney World's first permanent employee, passes away at age 83. 1990s as Disney World's senior vice president of administration and support. Actor, voice actor, comedian and singer Joshua Gad is born in Hollywood, Florida. role of LeFou in Disney's 2017 live-action version of Beauty and the Beast. best as the voice of Princess Merida in both the 2012 Brave and the 2018 Ralph Breaks the Internet. Touchstone Pictures and distributed by Disney's Buena Vista Pictures. 2018 musical fantasy Mary Poppins Returns (as Mary). novel of the same title by American writer Rosellen Brown, the film is distributed by Buena Vista Pictures. prince is cursed to live as a terrifying beast until he finds true love. between 2006 and 2017. Over her five decades of television acting, Helmond was known for her roles on the sitcoms Soap (1977-1981), Who's the Boss? (1984–1992), and 14 episodes of Everybody Loves Raymond.